This is Join Us in France Episode 189. 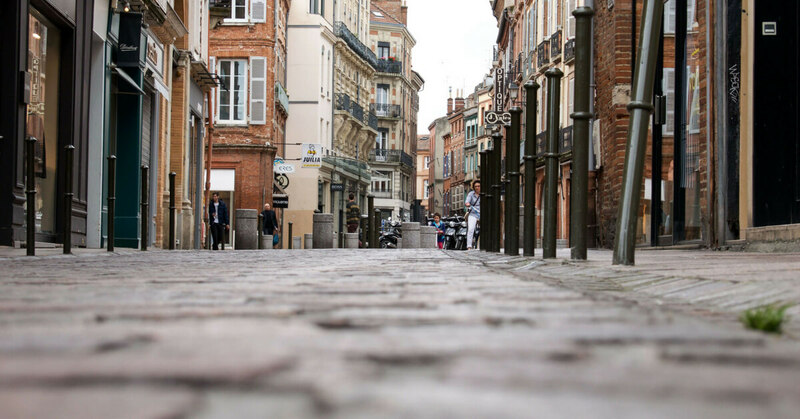 Bonjour, I’m Annie and Join Us in France is the podcast where we talk about France, its many quirks, its history, its language, and of course, destinations in France you want to learn about because, hopefully, you’ll be visiting soon. Join Us in France is brought to you by Patreon supporters and Addicted to France, the small group tour company for people who want to enjoy France to the fullest with zero stress. Check out our upcoming tours in May 2018. On today’s episode, everybody FREAK OUT! There’s a train strike happening in France spring 2018! OK, don’t freak out, I think I can help you take back control and have a great vacation in France all the same. I’m releasing this episode on Wed, March 21st 2018 and tomorrow is going to be a big strike day. Everyone who is a civil servant could potentially go on strike. I think it will most affect trains and classrooms this time. Then there are the SNCF train strikes planed April through June 2018. So, let’s talk about these strikes and how they work. I’m going to share links to critical websites and resources where you’ll go get current information about strikes. They will all be listed on this episode show notes page joinusinfrance.com/189 and the links will also be on your podcast app. Those of you who subscribe to the weekly Extra via email will also get the list in your inbox on Saturday. I’m excited to announce that Join Us in France is now available on the Amazon Platform! If you have an Amazon Echo or Amazon Dot, any device that is Alexa enabled, you can now listen to Join Us in France that way! For now this only works in the US, Canada should follow later this month, and hopefully other countries will follow soon also. I will give you all the details in the announcements at the end of the episode. And I will use some of the magic words, so if you’re next to your Amazon device, it may trigger it, you have been warned. 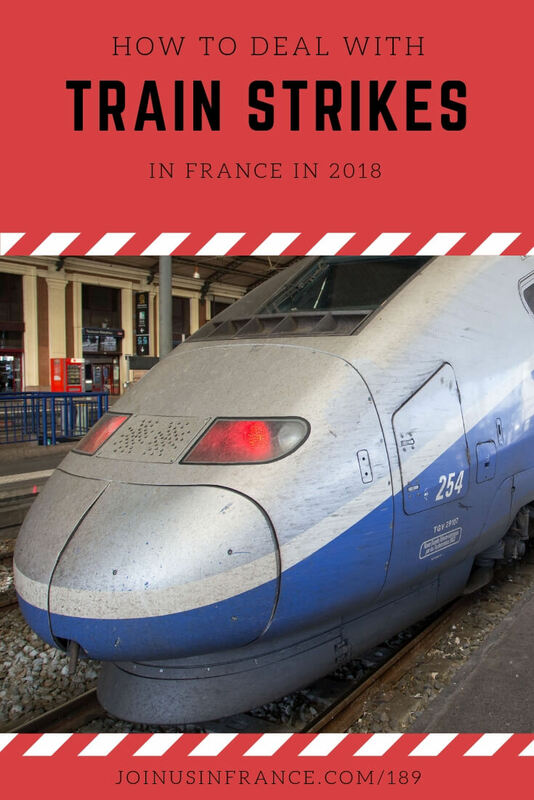 In this episode I want to tell you about train strikes in France because a long one is going to be taking place between April 3rd 2018 and June 28th, 2018. Those are the announced dates, but I will explain that announced dates don’t mean all that much in the French context. I’ll also give you my tips for what to do about it and give you the context of why all of this is happening. Strikes in France don’t work anything like strikes in the US, so I’m here to urge you to NOT base your decisions on how things work in the US, as you’ll get completely confused. I’ve wanted to dedicate an episode to this before, but it’s not the most upbeat of topics, so I always just mentioned it as a side note. But when you visit France you see come to see French sites and enjoy the culture. That’s the visible part of French culture. The hidden part that most visitors never see, the submerged part of the iceberg, if you wish, is the culture of strikes that we’ve had in France since WWII. I’m going to concentrate my remarks on the SNCF or French rail service today because that’s where we know there’s going to be a problem this year, but the same could be said about any other companies in France that have a lot of government employees or people who have government employee status. The strikes that most affect visitors have to do with the transportation sector, and we have a lot of companies in the transportation sector (for example RATP or Air France) where they go on strike on a regular basis, so you can extrapolate what I said about this strike to others that will surely happen because we get them all the time! BTW, striking rules differ between public sector and private sector, I will concentrate on public sector because that’s the part you should know about. If French lawyers go on strike (and they announced a strike for next week!) it won’t affect you, so I won’t try to be comprehensive. Unions have to state what day they intend to call their members to strike, that’s called a “préavis de grève” (advanced notice of a strike). They need to give a 5-business day notice minimum. You can see all the announced strikes on a site called cestlagreve.fr. This list is comprehensive and if you read that site too much, you’ll get really scared. Just keep in mind that most announced strikes do not take place, something is negotiated before the date arrives. But some weeks, all the strikes announced do take place and it’s a mess! Most of the time, strikers give more than the minimum 5-business day warning. Why? Because a strike is an instrument of pressure on the boss or politicians, they find it advantageous to start the pressure earlier. Just because a strike has been announced, doesn’t mean that it will happen as announced. I won’t start earlier, but it may end sooner than announced and it may also continue longer. If strikers intend to continue longer than originally announced, they again have to give a 5-business day warning, so keep an eye on that site cestlagreve. So, what does that mean in practice for you? 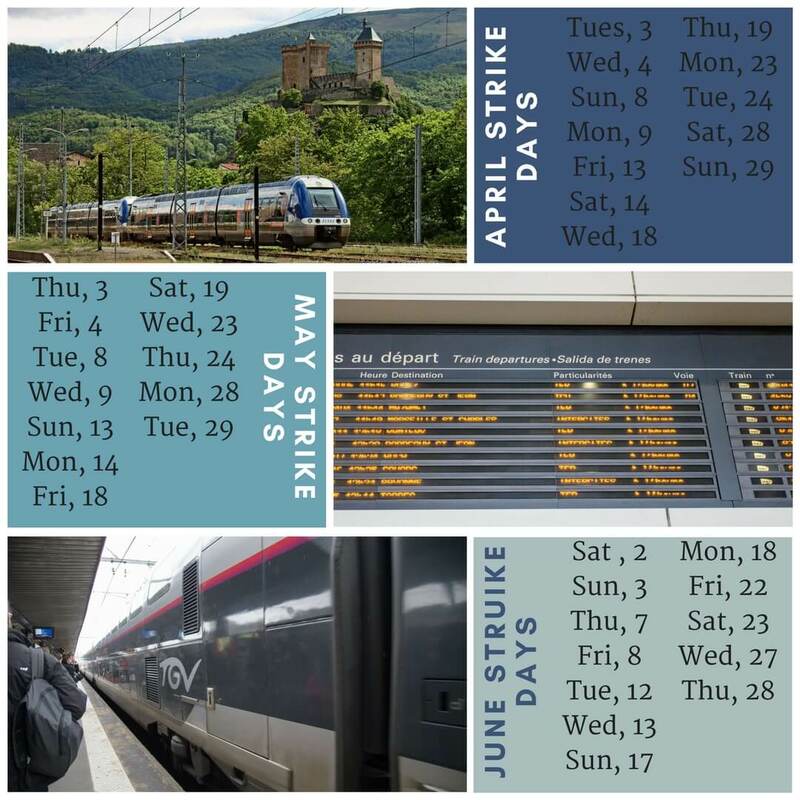 We know that this time the SNCF has announced an unusual strike schedule starting early April and ending late June. 2 days of strike, 3 days of work, then back to 2 days of strike, back to work, that will go on over April, May, and June 2018. The exact days are listed on joinusinfrance.com/189. Why are they doing it that way? Because they want to give it more time for pressure and negotiations. And, of course, not every train gets cancelled even on strike days. There’s a mandatory minimum service that has to take place on strike days. And some train workers don’t go on strike and keep working. The problem is, there’s no way to tell which ones will run and which ones will not, at least not more than 24 hours in advance. 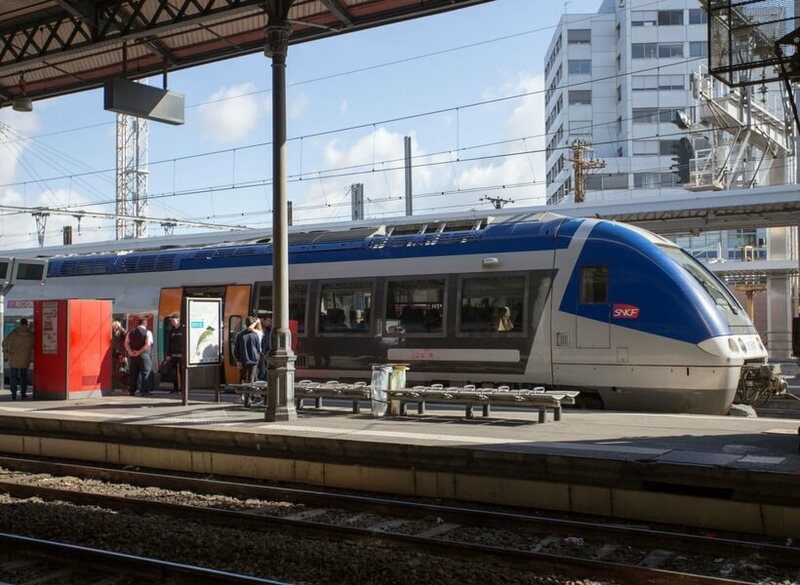 For the strike taking place tomorrow for instance, only 4 out of 10 TGV trains will run. Only 25% of intercity trains will run, only 30% of trains around Paris (that’s RER and the like), and 50% of regional trains in regions outside of Paris. Metro and buses will run, business as usual. That means that most of these workers agree with the strike and want to follow it. I know these numbers because the strike is taking place tomorrow and they’ve announced the numbers. There’s no way to tell how much following the strikes of April, May and June will get because that’s too far and hasn’t been decided yet. Individual workers don’t have to announce if they’ll go on strike or not. A person could be on strike one day and not the next. They have freedom to strike or not day by day, and they don’t have to tell anyone until the night before because there can’t be any pressure put on them one way or the other. In practice, that means if you’re trying to put together a crew to run a train tomorrow, you’ll find out slowly throughout the day who’s working tomorrow or not. They’ve put a rule in place for this strike that workers have to decide one way or the other the day before and tell their management. They don’t have to tell you or me, or the press, only their management. So, SNCF says they day before a strike day, they will try to announce by 5 PM what trains will run and which will not. Are you comfortable waiting until 5 PM one day to look to see if your train is going tomorrow? I wouldn’t be! That’s the reason why nobody can tell you if your train in two months is going to run or not. The workers themselves haven’t had to decide yet! 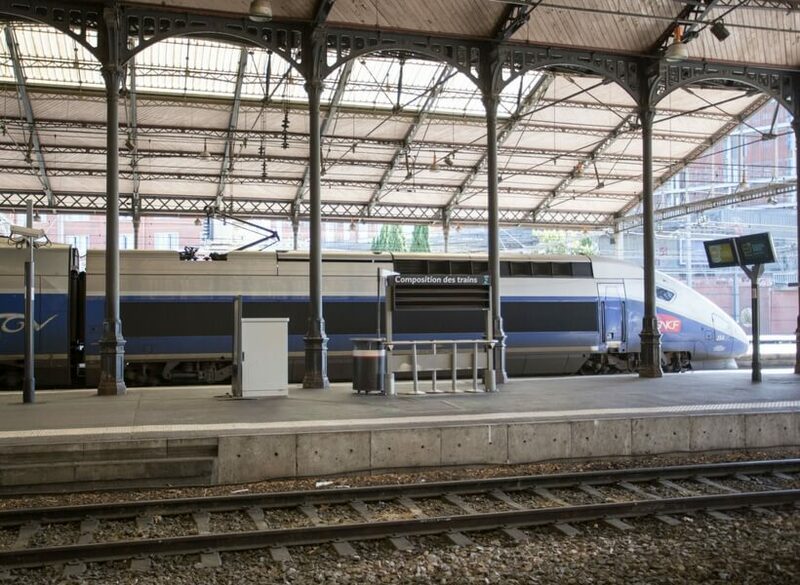 If you’re planning on taking the train in France at any time really, you should install the SNCF App on your phone and when you book your ticket you need to give them a valid phone number and email address. They say they will keep ticket holders informed via email and SMS. Will it work in every instance? Of course not! The App is called SNCF and the image looks like the SNCF logo. It’s pretty easy to find. You should install it and get familiar with it if you’re going to use the train. When you go to buy a train ticket for a train they already know won’t run, it will display it as either full or unavailable. If you already bought your ticket, they will tell you as soon as they know if that train is going to run or not via email or SMS. But like I said, they probably won’t tell you until the day before your train at 5 PM. If you don’t get notified, grab your ticket and enter the entire reference number on the SNCF site and you can find out that way. I’ll give you a link to the site in English where you can do that. There’s also a train status page that I’ll link to. If your train is late by more than 30 minutes or cancelled for any reason (including a strike), you can ask for a refund. I’ll also link to that page which doesn’t seen to exist in English, only in French. There’s also a free number you can call, it’ll probably be really hard to get through, but the number is 0805 90 36 35. That’s a French number, of course, I don’t know if it’ll work from outside of France. Another Tip: If you’re going to plan on using the train anyway, buy your ticket directly from SNCF. If the train you were supposed to take is not running, they’ll either suggest an alternative or refund your money without giving you any hassles. 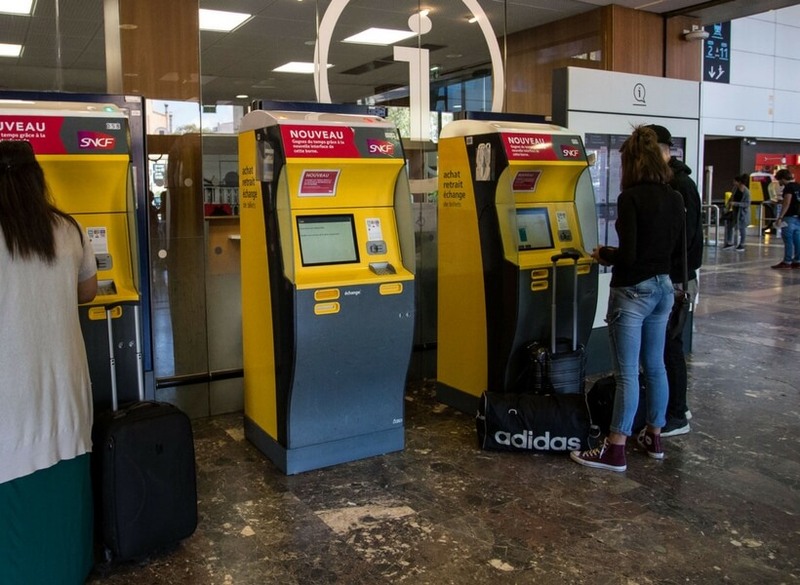 If you buy through companies like Rail Europe or other travel agencies that resell French train tickets, they may make you jump through hoops before they give you a refund because of a strike. Your travel agent in America cannot issue an actual SNCF ticket. 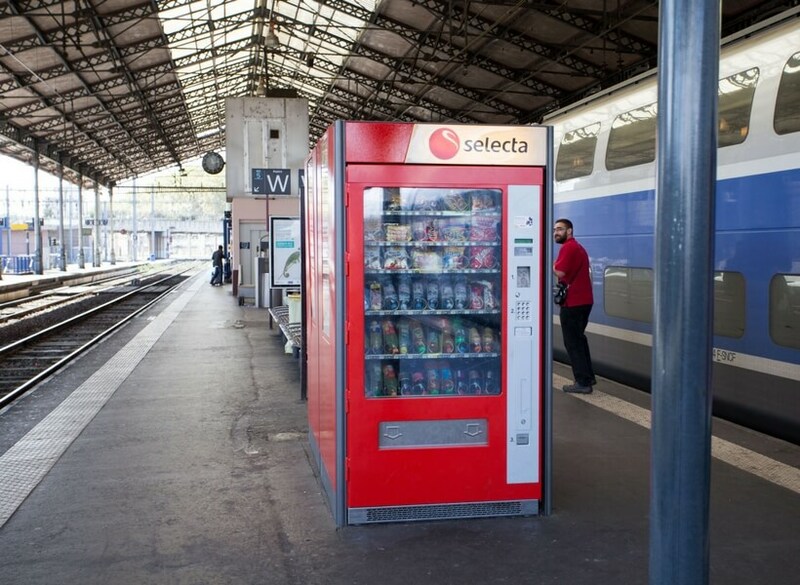 What they sell to you is a voucher you can exchange for an SNCF ticket. You can’t get those reimbursed at any French train station, they’ll send you back to whoever sold you the ticket. So, buy directly from the SNCF, the link will be in the show notes, buying from the SNCF App also works well. Here’s my advice to you: If you were planning on using the train in France this Spring 2018 and up until the beginning of summer I would keep this in mind: it’s possible that the strike will be over by then, but it’s also possible that it won’t. There’s no way to predict! It’s possible the strike won’t happen at all because there’s pressure on the government right now to back down. Maybe they will, maybe they won’t. They have backed down on one thing already: they took out the issue of retirement age from this round of legislative change. The level of uncertainty is huge. Looking back maybe you’ll say, this was all silly, it fizzled, it was business as usual in the end. Most strikes do fizzle and never go off. But with a big train strike like that, I woudn’t count on it! But I don’t know, nobody knows until it’s all behind us. So, what you need to do and what I would do is TAKE THE TRAIN OUT of your travel plans. Go another way! You can book a flight or buy a ticket for a regional bus, or rent a car, or find a ride share, but do not plan on taking the train unless you can deal with a high level of uncertainty. I can’t tell you what trains will and will not run and neither can the SNCF. You will find out the day before you’re scheduled to go at 5 PM. If that seems crazy to you, make different plans! Listen to the episode I did about using regional buses in France, it was Episode 75. The bus is a really good option. Good bus lines to consider are FlixBus, a big German company, very professional. You can install their App to see all the routes and buy tickets. Ouibus is also big, but it’s owned by SNCF, so that might make you nervous, but it probably shouldn’t because whereas train folks are government employees, bus drivers hired by the same company are not, so they don’t strike much at all. You also have isilines (spell), eurolines, trans’bus. Look them up, there are bus lines from everywhere to everywhere. Consider flying also if you need to go some distance. But I wouldn’t buy from Air France right now, JUST IN CASE. When train folks get excited, Air France may follow. They are birds of a feather so to speak. You have other options for flights within France with EasyJet, RyanAir, and others as well I’m sure. You could rent a car. For info on driving in France, listen to episode 138 and 16 of the podcast and search for the word “driving” on the site, we’ve talked about it often. Another good option is BlaBlaCar. It’s a ride sharing site that lots of people I know and trust have used and it’s really good. My husband used it to go between Toulouse and Barcelona because he doesn’t like driving long distances, and he enjoyed the experience. He chatted with the people the whole time and thought they were super friendly. This is particularly good if you speak some French or if you want to practice your French! It’s quite inexpensive also. Don’t start looking for a ride share 3 months before your trip, it’s too soon. Sign up on the site, then start looking a couple of weeks before you need to travel. Here are a few more things about strikes in France that you need to know about to understand why things work the way they do in France. French strikers do not get paid for strike days. I believe that it’s the opposite in America. But in France, Unions are not allowed to compensate workers for strike time. So, it’s difficult for a Union to convince workers to strike for a whole month since they won’t get a pay check that month. In France, it’s also possible to strike for a few hours in the day. Bus drivers did this a few years back in Toulouse. They went on strike every morning. No bus until 10 AM for over a month. So, nobody could get to school or work on the bus, but bus drivers still worked most of the day and still got paid for the rest of their hours. It was a huge mess for me because my daughter was in high school at the time and she always took the bus, well, that whole time I had to take her to school and face the horrible traffic, since everyone had to make arrangements to get to school or work without the bus. I was really fed up with the bus drivers, but guess what, I was glad when they got back to work! That’s the overwhelming feeling when long strikes end, relief. And strikers count of that to pressure the government to give them what they want. Now for a tiny bit of history. The French government was always heavily involved in industry. After WWII it was by necessity and moving forward it was because of ideology. French people leaned heavily towards communism and socialism, and while we never had a communist regime, we had leaders who saw nothing wrong with the government owning majority shares in many companies. Some examples of that are the electric company, the phone company, the water company, the train company, commuter trains and metros, buses, port authorities, ship-building companies, post-office, garbage, sewers, all of these jobs were government jobs or civil servant jobs for the longest time. This is on top of teachers, tax collectors, social security workers, public hospital workers including nurses and doctors. Being employed by the government never paid spectacularly well, but the perks were always wonderful, and for a long time young French people aspired to be hired by one of those publicly owned companies and get a government job. As time went by the government divested itself of all those shares in those public companies. They were too expensive to run like that, so one by one, little by little France Telecom, the phone company, was sold off. EDF, the electrical company was too, but more recently. Air France was also sold to private capital. But every time that happened, current employees who worked there already got to keep their government employee perks. New hires wouldn’t get them, but the old employees would. Of course there were strikes to guarantee this right to keep the perks! But despite that, there were always plenty of takers to invest in those companies because they were pretty good companies with good prospects for profitability. A big exception to that has been anything to do with rail. Nobody seems to be in a big hurry to take the SNCF off the hands of the government. By rail I mean the SNCF (the company that runs trains all over the country) and the RATP (the company that runs the Paris Metro and Paris Buses). Trains take different names in France, but they all belong to the SNCF. You’ll hear about the TGV (bullet train, that category also includes Thalys that goes east to Brussels, Amsterdam, etc and Eurostar that goes to London) , TER trains (transport express regional, they are run by regional governments), Transilien Île-de-France (Paris regional trains), Intercités (trains that run between French cities but are run by the French National Government, not the regions.) Then you also have Freight trains. That’s just a behemoth of a company that is going to be difficult to privatize. Bits of train service are being privatized, like for instance the folks who take care of disabled travelers called Accès Plus. I’m pretty sure they work for a separate company that contracts with SNCF. Other smaller services like that are getting sold off. But nobody has been able to take on the rail system per se. And it’s a good system. Train service is good in France, not perfect, but good. The trouble is, they strike too much! You know who never strikes in France? Boulangers, pâtissiers, restaurateurs, hotel workers. Somehow, they always work, and some of them don’t retire until they’re really really old, because they get no retirement perks. That’s the reality of French life that Macron is trying to address and I agree with him, this has to change. Strikes in France are designed to inconvenience users, although strikers will always say that it’s nothing like that. The idea is users will get really frustrated, but since so many of us were raised in France with French culture we’ll respect the right of strikers and despise the politicians who won’t give them what they want. This worked really well for decades in France, and it’s losing some steam, but if you look at opinion polls, at least 50% of the French population supports the strikers, even though it’s a mess and a huge inconvenience for all of us. 4.5 million French people take the train every day! Imagine what this upcoming strike is going to do to them! But send a reporter with a microphone and most of those train users will say “well, it makes me mad, but it’s their right”. The right to strike is a sacred cow of French life. French people are really attached to their right to strike, and to other people’s right to strike. I know people who have never gone on strike themselves (probably because they work in a profession where there are never any strikes) and yet they support strikers 100%, even if it’s a pain in the behind and they get frustrated when it inconveniences them. It’s a lot like Americans and the right to bear arms. Everybody in America gets horrified by the mass shootings, but when the dust settles, Americans support the right to bear arms, and nothing changes. It’s baked into the culture. And no matter how awful the situation gets with our many strikes in France, you still have a majority of French people saying, well, it’s their right and it must be upheld. Strikes are baked into the culture in France. Do Not Give Strikers a Piece of Your Mind! If there’s a picket line in France and there are cops around, the cops are not there to break up the picket line, they are there to protect the striker’s right to strike and stop angry users from disrupting the strike. As a visitor, what you must do is stay calm and find another way to where you want to go. Don’t argue with people on the picket line because you’ll get yourself arrested! I mention this because it actually happened to me. I was driving to Spain with American relatives in the car and there was a picket line at the last toll booth between France and Spain and that created 2 hours of traffic jam. We were stuck on the freeway with thousands of cars ahead of us and thousands behind us. Of course, we had to pee and were getting low on gas. The picket line was letting a few cars through, but so few that the backup was ginormous. When we finally got to the toll booth and we drove past the strikers, my relative rolled down his window and started insulting the strikers in English. He had been fuming in the car, but I didn’t see that coming. He would have gotten into a fist-fight with the strikers if we hadn’t driven off. The whole time he kept saying how this would never happen in America because people have guns in their cars and would shoot the strikers out of anger. Yeah, well, that would get you to prison in France, so I suggest you don’t do that. They have a right to strike, and the police is there to protect strikers from the angry public. Keep your mouth shut! I’m not going to go into too much history here, but there are companies in France that have striking in their DNA. These are companies used to be government-owned and where workers always enjoyed a lot of job protections and perks. Not high salaries, nice perks that I will list in a second. When I was growing up in France in the 70s, all my peers wanted to get a government job. That was their ambition in life. A steady government job with OK pay and great perks. I never heard any of my peers say “I don’t want to work for city government or the train system, they pay is too low”. They never even asked themselves if the pay was good enough because the perks were so good! Thank goodness by now, my daughter’s generation, most young French people don’t talk like that anymore. France is becoming more entrepreneurial, it’s a slow but steady change. But we still have a lot of 50 year-olds in charge at those companies that immediately go to organize a strike to protect their government jobs because that’s their mentality and they’re not going to change at this point! What Is the Reason for the 2018 French Rail Strike? 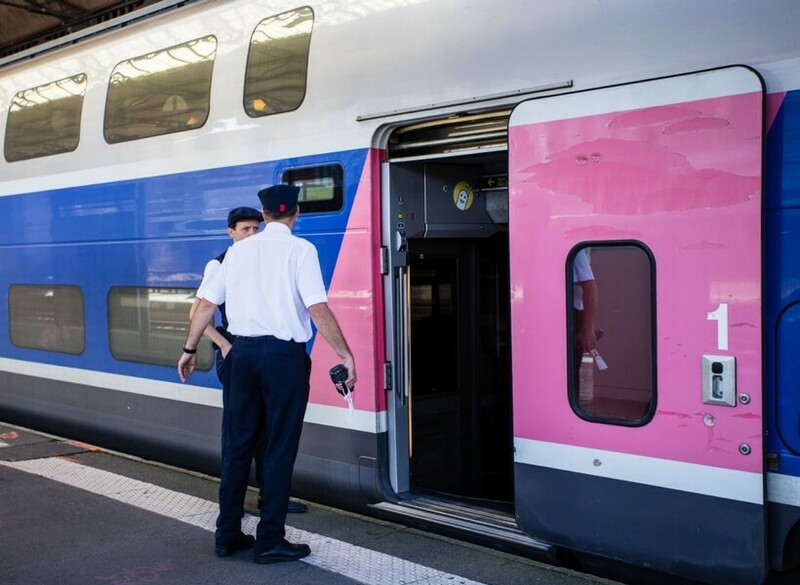 In this instance, the government is not proposing to change anything for current employees of the SNCF, they are saying that they don’t want to give those same privileges to new hires going forward. Why would they care? The reasoning goes like this: If new hires don’t get grandfathered in to the perks, maybe it will establish that the perks are unreasonable period, and then the sky will fall and life as we know it will end. I’ve talked to some of them, that’s really how they think. What Are the Perks of Working for SNCF? What perks are we talking about here? Let me list the big ones. 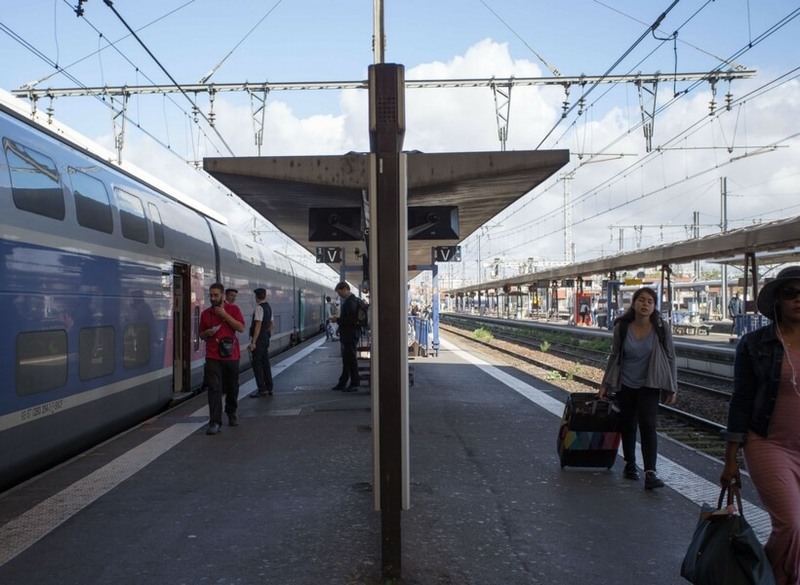 SNCF workers cannot be let go because of a dip in demand for train services. Even if the company is in the red (and it is!) their jobs are safe. Nobody takes that train line anymore? Nobody’s getting let-go. The workers will be asked to go work in another train station, but in that case commuting time is counted as work time, they cannot be asked to move closer to another train station. Automatic raises each year and automatic career advancement, so long as the worker participates in training. And, of course, training is free and counts as work hours. Automatic raise of 2.4% each year, even if the company is in the red. Wouldn’t you like that? Retirement at age 52 if your job involves working on the trains and 57 for everybody else. That’s 10 years earlier than most French people. And, here’s the clencher: Your retirement benefits are calculated based on your last 6 months of compensation (when necessarily you earned the most, automatic advancement and raises and all that). For other French workers, they calculate the amount of your pension based on your highest-earning 25 years. So, train workers also get much bigger retirement checks. Train folks get even better health care than the rest of French people. When they go see a doctor or specialist they never have any co-pays. The rest of us have co-pays, we get most of that money back from health insurance, but we have to advance the money and they don’t. Free train travel for life for you, your spouse and children. Should our President Macron get his way, new SNCF hires would not be offered most of those perks. Current hires wouldn’t see any changes, mind you, just new hires! They’d probably still travel for free, but that’s not the big cost here. Automatic raises, promotions and never getting let go, anyone? Macron has already made one huge concession, even before the strike starts: he won’t modify retirement perks right now. That will calm quite a few people down and indicates that they are talking and compromising already. Will it be enough to stop the strike from proceeding? Your guess is as good as mine, but my guess says no, it won’t stop the strike, at least not most of it. One day of strike costs the SNCF about 20 million euros. That’s because some trains are replaced by buses, travelers who are stranded between transfers late at night are offered free hotel rooms, tickets have to be refunded, and of course, loss of revenue. They’ve announced 36 days of strike for this round! This is not a trivial amount of money, especially for a country where the average cost of operation is 30% higher than in neighboring countries. So, mile per mile, the French rail system costs 30% more than say the German or Spanish rail systems. All those perks cost money! Then, there’s the human impact. 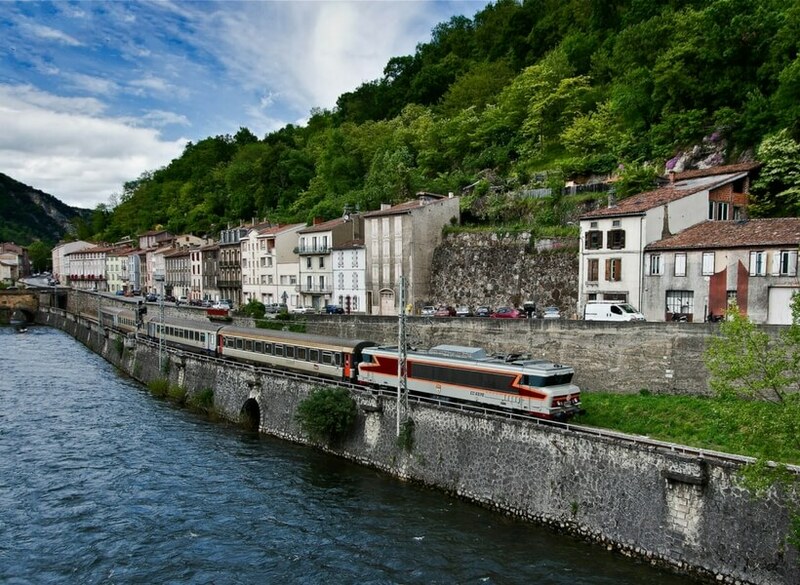 4.5 million French people take the train every day, they are heavily impacted, as is tourism. One of the comments on the Facebook group was that this will give tourism in France a black eye. It might, but there are strikes every year, and visitors keep coming back. It’s a huge inconvenience, but users forget and move on. Having said all of that, the number of strike days in France is going down overall. Younger people are seeing the unfairness of a system where the same people get all the protections and slowly but surely, strikes are getting less support. But it will be another decade or two before the majority of French people go against the strikers. It’s a that deeply engrained in our culture. But if you get stuck in a strike in 2018, you don’t care about the trends, for you it’s 100% a pain in the behind. That’s why I say, don’t take the train this Spring. Maybe it’ll all work out and the strike will not go off, but you don’t know that, so make other plans. Listen to Episode 75 about Bus transportation in France, there are good options out there! Macron makes no bones about it, he’s told train workers that the country can’t afford to continue guaranteeing new hires that they’ll retire by 52 when French farmers, bakers, small business owners, and independent workers are lucky if they save enough to EVER retire. This situation is one of the sacred cows of French life. Certain workers get sweet benefits while others get nothing at all. Macron has been tackling this situation and the reaction from the SNCF was predictable: they’ll be going on strike. Possibly over and over again. But, let me tell you what, folks. SNCF, RATP, and Air France have gone on strike every year around May and June every single year for the last 20 years, so nobody is surprised. If it weren’t for Macron’s plan, they would have found some other reason, as they have, predictably, every year for as long as anybody can remember. Call me Nostradamus, I am here to predict that SNCF, RATP and Air France will go on strike again around May and June 2019 and 2020. I’ll tell you when they NEVER EVER go on strike: Mid-July to late August. Why? Because that’s vacation time and nobody strikes when they should be on vacation. I’m not being cynical, that’s how it works! So, my advice to you is this: don’t give yourself an ulcer over this, make alternative plans. Avoid the train completely and go with a car rental or a regional bus, a plane or even a ride share. And if you’re in Paris and there’s an RER strike, look at bus options. If there’s a metro strike, look at bus options. Install the RATP App on your phone and you will see all of them in real-time! And, of course there’s always Uber, for tips on that listen to Episode 151. I think what gets to people is the uncertainty of this whole situation. Americans want answers and they want them now! Well, that’s not how it works in France. We’re used to living with some level of wait and see. French people can navigate through a strike like nobody’s business because they’ve done it 100 times! This would be your first time, so, unless you’re training to become a little bit more French, avoid the whole thing and plan on other modes of transportation. Thank you Jeff Miller and Danielle Pham for pledging to support the show on Patreon this week and thank you Barbara Livieri for editing your pledge up! My my thanks also to all the other patrons who support the show month after month, thank you for giving back! To support the show on Patreon, go to PATREON.COM/JOINUS and you guys rock! So, like I said at the begining of the show, Join Us in France now has its own skill for Amazon devices, one of the first podcasts to get this, and I’m really excited about it! If you’re next to your Amazon device, I will now say words that will trigger it, so turn it off or listen away from it! It’s really exciting that with this device you don’t have to touch any buttons, you can totally control everything with your voice! Perfect for when you’re making dinner or your hands are busy! I’m not sure how I feel about you bossing me around like that, but I think you’ll enjoy it! It’s THAT EASY! You can also enable Join Us in France from the Alexa App or website if you prefer that, but you can just use your voice. And, as you know, Amazon is a company that cares a lot about ratings and reviews, so if you can figure out to write a review on Amazon for Join Us in France, I would love that! I can’t tell you how because I don’t know myself. One of you smart folks will figure it out and tell me how! Join Us in France is also available on iTunes, Google Play, Spotify, and YouTube, but adding the show to the Amazon platform makes it easier than ever to listen to the show. Especially for people who are not in the habit of listening to podcasts on their phone, but enjoy listening to audio programs around the house. So, if you know someone who loves France and enjoys their Amazon devices, tell them they can listen to Join Us in France, all they have to do is ask! I’ll be mentioning this for the next few episodes and I’ll also send out these instructions to the email list. But I’m counting on you to spread the word, Join Us in France is on Alexa! And the weather is playing a nasty trick on me, first day of Spring it got so cold it almost froze my newly bought plants that I hadn’t put in the ground yet! That’s not how it’s supposed to work! We want Spring and warm temperatures now! 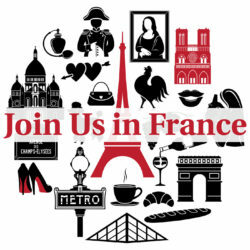 The best way to connect with me is via email annie@joinusinfrance.com or if you have a question you’d like answered on the show, leave a message on 1-801-806-1015. You can also join the awesome Join Us in France Closed group on Facebook where lots of knowledgeable folks hang out and exchange France trip advice. Au revoir, have a great week of trip planning!